We’d love your help. Let us know what’s wrong with this preview of The Divorce Party by Laura Dave. Two women at the opposite ends of marriage are trying to answer the same question: When should you fight to save a relationship and when should you begin to let go? On their thirty-fifth wedding anniversary, Gwyn Huntington and her husband, Thomas, invite friends and family over for a most unusual celebration. Their home, Huntington Hall, has been in the family for generati Two women at the opposite ends of marriage are trying to answer the same question: When should you fight to save a relationship and when should you begin to let go? On their thirty-fifth wedding anniversary, Gwyn Huntington and her husband, Thomas, invite friends and family over for a most unusual celebration. Their home, Huntington Hall, has been in the family for generations after surviving the Great Hurricane of 1938, which tore Montauk apart. Instead of celebrating their life there, Gwyn and Thomas are toasting their divorce. The weekend also marks the first time that their son, Nate, brings his fiance, Maggie, home to Montauk. But Maggie finds herself wondering if it will be the last, because she discovers a secret Nate has kept for years. To ask other readers questions about The Divorce Party, please sign up. This book was just ok. Didn't love it and didn't hate it. Would I recommend it? No. What kind of a couple throws a huge party on their thirty-fifth anniversary to celebrate, not the event itself, but the fact that the marriage is ending? This particular divorce party is marking the end of a coupling that others thought would survive anything—the Huntingtons come from a family of survivors on this island of Montauk. And Gwyn and Thomas seemed to be the perfect couple. As the guests assemble for this lavish get-together, another couple, just beginning their journey together, is a What kind of a couple throws a huge party on their thirty-fifth anniversary to celebrate, not the event itself, but the fact that the marriage is ending? This particular divorce party is marking the end of a coupling that others thought would survive anything—the Huntingtons come from a family of survivors on this island of Montauk. And Gwyn and Thomas seemed to be the perfect couple. As the guests assemble for this lavish get-together, another couple, just beginning their journey together, is also coming from a home in Red Hook, near Brooklyn, NY. This will be Maggie's first introduction to her fiancé's family. Nate has said little about them; in fact he seems unusually reticent. Then on their trip to Montauk, through a series of chance meetings along the way, Maggie first glimpses some of the secrets Nate has kept from her. The cracks in the thin veneer that protect them are spreading and threatening to burst. Her first doubts appear. More is revealed in the first days in Montauk, and the journey may abruptly end unless something drastic happens. Meanwhile, we see Gwyn's story unfolding, layer by layer, as she relives through memories the journey she and Thomas have taken. And we slowly learn why Gwyn has chosen this particular venue—the divorce party—to mark the demise of the marriage. Alternately told in Gwyn's and Maggie's voices, we discover what it means to build a life with someone and how, by making very different choices, two different women learn how to create the lives they most want to lead. What are the secrets Nate has kept, that threaten his new relationship? And what motivates Gwyn to choose this very public setting to end hers? Is there more she hopes to unleash? And will she get the results she seeks? These are some of the questions resolved in these pages, giving "The Divorce Party: A Novel" a resounding five stars, in my opinion. Sixty-nine years later the love has gone from the home. Instead of a thirty-fifth wedding anniversary, Gwynn Huntington is planning a divorce party. She and her husband have grown apart as he finds a new religion. Gwynn though kn The Divorce Party has a strong sense of place. It starts with the 1938 hurricane that destroyed most of Montauk Island (off the coast of Long Island). It's the ferocity of the storm that cements their choice to marry. Together they vow that the house will see everything. Até poderia ter dado 2 estrelas, mas algo na estória me levou a "puxar" um pouco mais. No fim tudo se resume à dor da separação, à luta por um amor e ao cansaço de se lutar sozinha muitas batalhas. If London Is the Best City in America is a good book, this is a GREAT book. I loved the characters and the setting. It was very cinematic, and I think it will translate into a movie quite well. The whole book takes place in one day. Maggie is about to meet her future in-laws at their Divorce Party. Yes, Divorce Party. The couple, Gwyn and Thomas, is throwing in the towel after nearly 35 years of marriage. Thomas has found religion (or at least that is his version of him growing apart from his wife) and doesn’t see Gwyn as part of his journey int The Divorce Part by Laura Dave is one of the best books I have read in awhile. You know a book is good when it only takes me 3 days to read it! The whole book takes place in one day. Maggie is about to meet her future in-laws at their Divorce Party. Yes, Divorce Party. The couple, Gwyn and Thomas, is throwing in the towel after nearly 35 years of marriage. Thomas has found religion (or at least that is his version of him growing apart from his wife) and doesn’t see Gwyn as part of his journey into Buddhism. Gwyn decides the throw a Divorce Party to celebrate the end of the relationship and the beginning of their new futures. Then we have Maggie and Nate, Gwyn and Thomas’ son. Newly engaged, about to start a restaurant business of their own, and head over heels for each other. Maggie has been a commitment phobe her whole life mostly because of the traumatic experience of her mother walking out on her when she was younger. Maggie hangs in there through each revealed secret until Nate’s sister Georgia spills the biggest secret of Nate’s past. I didn’t blame Maggie for second guessing her entire relationship and future with Nate at that point. I don’t want to give any spoilers because I want you to go devour the book like I did but you will discover just how clever Gwyn is as her story unravels to the very end. The story is told by alternating back and forth between Maggie and Gwyn. I love the way Laura Dave writes. Page after page the back story of these two women are told as secrets are revealed about each man and how Maggie and Gwyn are seeing their lives unfold before them. Dave is a very gifted story teller. She keeps you hanging at the end of every chapter. You do have to read chapter in succession because they build upon each other. Dave makes you feel as if you are right there at the side of each character watching the story unfold. It is the way these 2 women analyze their lives(past, present and future) that makes the reader get sucked in. I highly recommend this book for a lazy weekend when you can shut off the phone, grab a cup of coffee and relax with a good story! When reading a Laura Dave book, I almost feel like I am reading an Emily Giffin book. Dave’s stories – or at least the two I have read: “The Divorce Party” and “The First Husband” – like Giffin’s are centered on females with complicated love lives. What separates Giffin and Dave from other authors in the romantic comedy/chick lit genre, though, is that their stories have substance. While their books may be quick-paced and perfect for the beach, they aren’t full of fluff. They can actually be qui When reading a Laura Dave book, I almost feel like I am reading an Emily Giffin book. Dave’s stories – or at least the two I have read: “The Divorce Party” and “The First Husband” – like Giffin’s are centered on females with complicated love lives. What separates Giffin and Dave from other authors in the romantic comedy/chick lit genre, though, is that their stories have substance. While their books may be quick-paced and perfect for the beach, they aren’t full of fluff. They can actually be quite thoughtful and resonate within the reader (or at least this reader). With all that said, though, Dave isn’t quite on the same level as Emily Giffin. Don’t get me wrong - “The Divorce Party” was a terrifically engaging story. Told in alternating chapters by the interconnecting characters Maggie–the young woman on the verge of marriage–and Gywn–the seasoned woman on the verge of divorce–the chapters always left me wanting to read more. I also appreciated how the story surprised me. When I thought Dave was going a predictable direction, she went into another. 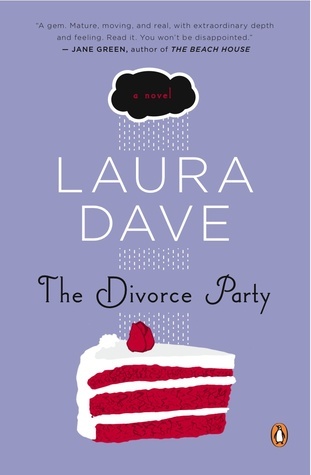 But I gave Laura Dave’s “The Divorce Party” 3/5 stars because I felt like the story was a little rushed. Coming in at only 244 pages in a small sized book, I finished the book in two days and probably could have made a run at one day if I started the book earlier on day one. The book seemed to place emphasis on brevity and concision because at some points the characters would say something and I would not know how they got to the point. It almost seemed like there were lines missing that were edited out for whatever reason. The flow of the story was definitely interrupted due to the need to reread lines and make my own inferences. After noting a typographical error in the text, I found myself wondering if the book was rushed for publication and did not receive proper and concentrated editing. Nonetheless, I did like “The Divorce Party” and would recommend it for anyone who enjoys chick lit with substance (got to give props to my friend Marisa for that characterization). Laura Dave may not be Emily Giffin, but she could at least be the author you read in between Emily Giffin’s books. First of all, I read most of this book while laying on my new awesome hammock so that may have added to the enjoyability! I think the book would be just a light, quick read. And it was pretty quick! But, it was pretty thought-provoking, actually. Made me think about marriage, and what it means- And more importantly, the whole idea of truly being intimate and honest. I'm a songwriter, and it's a topic I find comes up over and over in my writing. That need and want to lay all the cards out for som First of all, I read most of this book while laying on my new awesome hammock so that may have added to the enjoyability! I think the book would be just a light, quick read. And it was pretty quick! But, it was pretty thought-provoking, actually. Made me think about marriage, and what it means- And more importantly, the whole idea of truly being intimate and honest. I'm a songwriter, and it's a topic I find comes up over and over in my writing. That need and want to lay all the cards out for someone, and for them to love you despite all the "bad" parts. I loved the 2nd half of the book once I was laying in my hammock and really paying attention to the book. Not sure why I was a little slow to get into it, it could have just been me and all the random thoughts I had running thru my brain. I'm going to read Laura Dave's other book and pay better attention next time! Um livro que começou a ser interessante, mas que, sensivelmente a partir da sua metade, foi perdendo o fulgor. A estória aborda perspectivas interessantes sobre relacionamentos ... Aqueles que se iniciam, os já com algum tempo e os relacionamentos de longo prazo. Pressupunha que fosse ser uma leitura rápida, devido ao número de páginas e à leveza do conteúdo em si, mas para o final foi perdendo o fulgor e tornou-se uma leitura arrastada. A dada altura, pensava que estava a ler uma soap opera e nã Um livro que começou a ser interessante, mas que, sensivelmente a partir da sua metade, foi perdendo o fulgor. A estória aborda perspectivas interessantes sobre relacionamentos ... Aqueles que se iniciam, os já com algum tempo e os relacionamentos de longo prazo. Pressupunha que fosse ser uma leitura rápida, devido ao número de páginas e à leveza do conteúdo em si, mas para o final foi perdendo o fulgor e tornou-se uma leitura arrastada. A dada altura, pensava que estava a ler uma soap opera e não a ler um livro. I enjoyed reading this book even though I have mixed emotions about what happened. I'm pretty sure that was the point, though -- this is one of those stories that is intended to show you that life is not that simple and love and loving someone over time is complicated. I like that Laura Dave balanced the characters well -- no one was too strong or too weak -- and they were all likable despite their many weaknesses. There were a few plot issues that I wasn't wild about (for example, that Ryan is I enjoyed reading this book even though I have mixed emotions about what happened. I'm pretty sure that was the point, though -- this is one of those stories that is intended to show you that life is not that simple and love and loving someone over time is complicated. I like that Laura Dave balanced the characters well -- no one was too strong or too weak -- and they were all likable despite their many weaknesses. There were a few plot issues that I wasn't wild about (for example, that Ryan is now a lesbian... that seemed too out of whack and irrelevant) but overall I think this is great book. I like Laura Dave's writing because it's full of realism so you're not guaranteed a Hollywood ending, but she does leave the reader with a sense of hope. Maggie is engaged to Nate and they are working to open a restaurant together. On the day that they are traveling to Montauk to meet his parents for the first time, she is barraged by all sorts of information about Nate that she never new or imagined. It's one reveal after another, leading to a very quick and compelling read. And, the occasion for meeting Nate's parents (Gwyn and Thomas) is their Divorce Party. Nate's parents have also been holding secrets from one another. Sweet and moving... thought provoking. Reminders of the realities of life and love... of acceptance and letting go. "....She recognizes him in the way we get to recognize the people we are supposed to meet, the ones we have been waiting our whole lives to meet. Does that mean that Gwyn turns out okay, just because she's found someone else, someone who wants to see her? No, not as far as she is concerned. As far as she is concerned, it means she turns out okay because she believes - in that hotel Sweet and moving... thought provoking. Reminders of the realities of life and love... of acceptance and letting go. "....She recognizes him in the way we get to recognize the people we are supposed to meet, the ones we have been waiting our whole lives to meet. Does that mean that Gwyn turns out okay, just because she's found someone else, someone who wants to see her? No, not as far as she is concerned. As far as she is concerned, it means she turns out okay because she believes - in that hotel barroom, for the first time in such a long time - that she should be seen." The book was great..I loved the way the author used the chapters. She had each chapter from a character's point of view, very cool. This a great love/betrayal/revenge story! This was really, really good. I loved Gwyn and thought this book was well written and just all over perfectly done. I can't wait to read more from this author! A very moving and emotional look at 2 relationships. One as it begins and another as it ends. Highly recommended! 4 stars. Absolutely gorgeous. Give yourself a treat and read this book. I was waiting and waiting and waiting for this book, having found myself devouring London so quickly that it surprised me. Very few writers have had that effect on me in a first read. Maybe Judy Blume back in the day. I enjoyed the story, the surprises (something else I rarely experience as if truly experiencing), and the interweaving of lives. I read in swiftly in one day and it led me to run to pick it up into a much needed long awaited respite and journey into these characters worlds, that st I was waiting and waiting and waiting for this book, having found myself devouring London so quickly that it surprised me. Very few writers have had that effect on me in a first read. Maybe Judy Blume back in the day. I enjoyed the story, the surprises (something else I rarely experience as if truly experiencing), and the interweaving of lives. I read in swiftly in one day and it led me to run to pick it up into a much needed long awaited respite and journey into these characters worlds, that still can have aspects so like our own. Gwyn is a party planner who has been a leader in all different kinds of celebrations for other. Including Divorce Parties. After being married for thirty-five years, her marriage is over. Now, she is throwing her own divorce party which she knows will be different from all the rest. Meanwhile, Maggie is looking forward to starting her life with the man of her dreams. This may sound wonderful right now, but she still has to meet the in-laws. Weddings and divorce may seem like complete opposites but Gwyn is a party planner who has been a leader in all different kinds of celebrations for other. Including Divorce Parties. After being married for thirty-five years, her marriage is over. Now, she is throwing her own divorce party which she knows will be different from all the rest. What a wonderful way to spend an afternoon! I have been less than enthused about work related books lately but this one was a pleasant surprise. The writing was beautiful, the subject matter relevant and touching, and left the reader feeling hopeful! I really enjoyed reading this sweet little treasure about love, loyalty, and the choices we make to be happy, or not. I was pleasantly surprised by this book. Told alternately by two women: one who is older and ending her long marriage and another who is younger and getting ready to enter marriage. There was depth to this book and the characters really struggled with their personal issues. I enjoyed it and look forward to reading more by this author. I really liked this book, about an engaged couple that goes to his parent's divorce party out on the Hamptons - they're at the start of their marriage and the parents are at the end of theirs. Interesting character development and I liked the way she wrote. This was a fun quick read. There is just something about these type of books that I enjoy. Maybe it is because I don't have to use alot of brain power to stay up on the story line. A good fun, fast summer or vacation read! I am a huge fan of Laura Dave and this book, while different than London Is THe Best City in America, was not a disappointment. It alternates between a young woman and her soon-to-be mother-in-law and both voices and wonderful. Laura Dave is the author of the critically acclaimed novels The First Husband, The Divorce Party and London Is The Best City In America. Her novels have been published in fifteen countries, and three of her novels, including Eight Hundred Grapes, have been optioned as major motion pictures. She resides in Santa Monica, California. Her new novel, Eight Hundred Grapes, will be released on June 2nd, 2 Laura Dave is the author of the critically acclaimed novels The First Husband, The Divorce Party and London Is The Best City In America. Her novels have been published in fifteen countries, and three of her novels, including Eight Hundred Grapes, have been optioned as major motion pictures. She resides in Santa Monica, California. Her new novel, Eight Hundred Grapes, will be released on June 2nd, 2015.